Digital music stand for reading sheet music, basic version available. 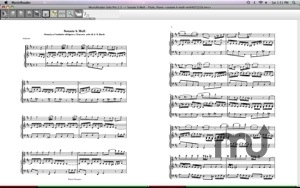 Developer website: Leoné MusicReader B.V.
Is there a better alternative to MusicReader Solo Pro? Is MusicReader Solo Pro really the best app in Music category? Will MusicReader Solo Pro work good on macOS 10.13.4? Possible to change the height of the half page turn (One page view only). Faster application startup with large music libraries. MusicReader Solo Pro needs a rating. Be the first to rate this app and get the discussion started!